When the then Indonesian President, Susilo Bambang Yudhyono, was presented with two maps of the country’s primary forests by different government agencies at a cabinet meeting in December 2010 on ongoing REDD+ work, it became clear that the spatial data presented was conflicting. REDD+ refers to efforts aimed at ‘reducing emissions from deforestation and forest degradation in developing countries, and the role of conservation, sustainable management of forests, and enhancement of forest carbon stocks in developing countries’. In the search for an explanation, it was found that the two ministries involved utilised different definitions of forests and different mapping methodologies. Consequently, the idea of One Map for Indonesia was mooted. The One Map policy, as proclaimed in the Indonesian Presidential Decree No. 4/2011, was aimed at unifying and synchronising Indonesia’s spatial data for use by all parties, integrating 85 thematic maps of regions across the archipelago into one. This is no small feat considering it is the world's largest island country and fourth most populous country, with 13,466 islands amounting to over 1,904,569 square kilometres of land and sea area. Around 6,000 of the islands are populated by a total of over 261 million people. The map integration effort, spearheaded by the Indonesian geospatial information agency, Badan Informasi Geospasial (BIG), is expected to be launched in August, before the country’s 73rd Independence Day. The tanahair.indonesia.go.id portal will be accessible to the public. However, some maps, particularly those that showcase local resources and private ownership, will be restricted. Further synchronisation work will be carried out after the launch. Another key driver of the One Map Policy is the need to eliminate duplicating licences for or overlapping rights issued for the same land area. According to Forest Watch Indonesia (FWI), 14.7 million hectares had overlapping licences for forest concessions, industrial forest plantations, and mining areas, while seven million hectares covered by natural forest is located on land with conflicting licenses among forest concessions, industrial forest and oil palm plantations, and mining areas. There are also cases where licences overlap with protected areas and customary land. 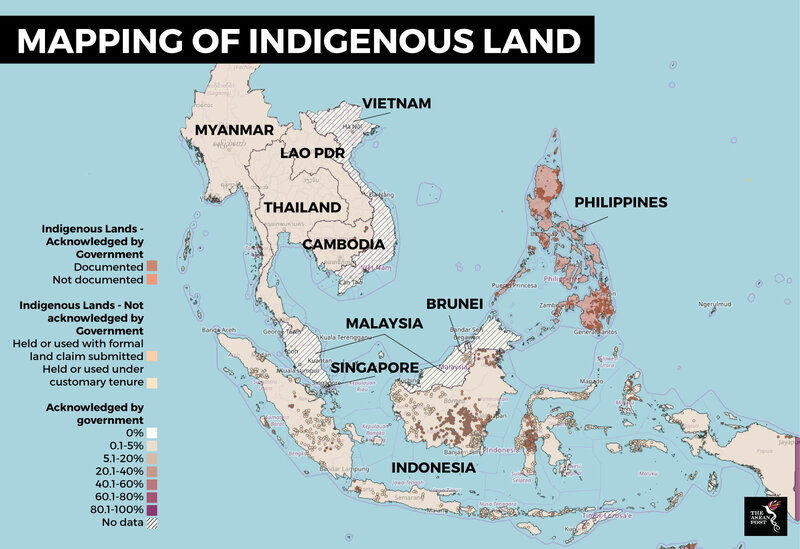 Last week, the well-known source of environmental news reporting and analysis, Mongabay, reported that the Indonesian government has decided to not include maps of indigenous territory in its One Map Policy when it is launched this month. According to the report, the customary maps will be included once all of them have been formally recognised by local governments, which will require passage of a bylaw in each of the hundreds of jurisdictions in which indigenous lands occur. This is despite the fact that some of the maps have been formally recognised by the various local governments. The exclusion has drawn criticism from indigenous rights activists, who say it defeats the purpose of the One Map Policy, which is to resolve land conflicts including those involving disputes over indigenous lands. For the indigenous, the concept of land and territories has many dimensions, which are vital to their collective identity. Violations to their right to land and resources are recurring themes in the survival of the indigenous people, the impact of which is critical to their lives and livelihood due to the closer relationship the indigenous people have with land as opposed to mainstream societies. Protecting their ownership and their right to their land has resulted in exposure to aggression and violence. In the north-eastern state of Kelantan in Malaysia, another group of indigenous people are struggling to retain control over their land and communal forest to sustain their traditional way of life. The Temiar people of Gua Musang who live within the boundaries of Gunung Stong Selatan forest reserve have been protesting against logging and durian plantations on their communal forested land. The have set up several road blockades, the last of which lasted months until it was razed down by chainsaw-wielding ad hoc workers of a durian plantation, this week. The establishment and operation of logging and agricultural plantations in the area has devastated the forest, exacerbated soil erosion, degraded river water, and increased conflict between humans and wild animals. The uncontrolled development in the Ulu Kelantan area, which is a forest water catchment area which provides clean water to half of Kelantan, has been cited as one of the contributing factors to the record-setting 2014 flood in the state. In Myanmar, areas inhabited by ethnic minority Karen people are not only vulnerable to land confiscation and forced displacement due to mining, infrastructure and development projects, but also from the fact that they have been declared as protected areas by the government. The Myanmar government does not recognise the territorial rights of indigenous people over customary land and forests that have been declared as protected areas. This has led to the uprooting of indigenous communities that have been living in these designated protected areas. A study by The World Resource Institute found that deforestation is significantly lower within formally recognised indigenous-held lands, with average annual deforestation rates inside tenured indigenous forestlands two to three times lower than outside. In the Philippines, for example, in the ancestral forests of the Ikahalans, LandMark’s new carbon storage analysis tool estimates that the trees there hold nearly 3 million tons of carbon, with an average of 96 tons per hectare across the entire territory. The total carbon stored is equivalent to the yearly greenhouse gas emissions from 2.3 million passenger vehicles. The protracted conflicts between indigenous people, governments and/or private companies have eroded the native community’s rights to and governance of their customary lands and resources. This does not just impact the sustainability of forested areas, but also the supply of clean water to people living beyond their settlement boundaries. The global carbon stock that influences global climate is also affected. Indigenous issues are national issues, and indigenous struggles are our struggles as well. There is a need to mainstream the concerns and needs of indigenous peoples. The International Day of the World’s Indigenous Peoples, which is marked on 9 August every year, should not be seen as just an opportunity to enjoy indigenous music performances and colourful costumes. It should also be a call to honour indigenous peoples’ rights to their customary lands and resources.